Many centuries before the time of this legend, Ganon, trapped in the Four Sword, was sealed in the Dark World together with his minions. In the ages that followed, the Hylians few direct descendants settled in various parts of the world and passed their knowledge and magical lore to all people; though in its passing, the lore was often distorted or lost altogether. The legends of the Hero of Time and the wielder of Four Sword were combined into one and became known as the Imprisoning War. The stories about it do not mention the heroes nor the Shrine Maidens, but refer to the Knights of Hyrule and the Seven Wise Men as saviors of the land. The conflict imposed its toll on many races: the Gorons who migrated to more peaceful lands, the Sea Zoras who returned to their home and left their domain to their river cousins, the Gerudos who lost their king (and only male), and the Hylians who decayed and disappeared among common people, losing part of their attitude toward magic. So it is no surprise that no one was prepared for the new disasters that suddenly struck Hyrule. Pestilence and drought, uncontrollable even by magic, ravaged the land. The king of Hyrule ordered an investigation of the Imprisoned Dark World but the wise men's seal was apparently intact. Despairing the people fervently prayed the Gods, and the King offered rewards for anyone who could find the source of these troubles. In answer to these summons a stranger named Agahnim came and quelled the disasters with a previously unseen form of magic. As a reward, the king gave him a new position as chief advisor, hailed him as the second coming of the Seven Wise Men and the masses proclaimed him their hero. Rumors of strange magical rituals in the castle tower at night... The people of Hyrule were again gripped by dread. 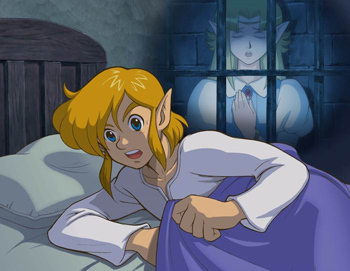 One night a young man named Link, is awakened by a girls voice. She telepathically plead, telling Link that she is Zelda, a prisoner in the castles dungeon; that the wizard Agahnim is an inhuman fiend who has magically seized control of the castle soldiers and has done... something to the other girls that were missing, so she is the now last one and that hes trying to open the seven wise mens seal. The request for help still echoing in his head, Link sat up in his bed not knowing whether the voice was part of a dream or reality. He found his uncle, who should be fast asleep at this time, preparing to go out, girded for battle. He promised to come back by morning and told Link not to leave the house. Link watched him leave, sword in hand and shield on arm; the confused youth decided then to look for the girl named Zelda, he took a lamp and got out of his home in the stormy ill-fated night. 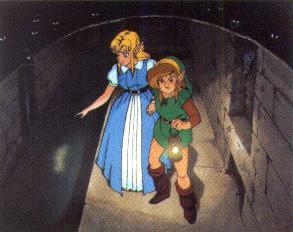 The castle guards wouldnt let him in, but he found a secret passage as telepathically suggested by Zelda. reached the sanctuary below Death Mountain. There an old priest welcomed the two and offered to hid Zelda; he was of the belief that the only weapon potent enough to destroy the wizard was the legendary Master Sword, so he directed Link to Kakariko village where he should find an elder who was said to be a descendant of one of the seven wise men. On the way to the village Link found that "the King" had put a reward on his head for kidnapping the princess; he would have to be careful. Once at the elders home he met an old lady that told him the Elder was not seen since the disappearance of the maidens. When Link mentioned the Master Sword she told him about the mythical blade and that it was said to be sleeping deep in the forest. Wandering in the village he learned from a young boy that the elder was hiding near the palace east of the castle. There Link finally met up with Sahasrahla; he said the legend stated that only a hero who has won the three Pendants can wield the Master Sword and told Link he would find the Pendant of Courage in the near palace. there Link met Aginah, who sensed that something was happening in the Golden Land, a omen of the Great Cataclysm foretold by the Hylian prophecy saying: The Hero will stand in the desert holding the Book of Mudora. After finding it Link translated the inscription at the entrance of the Desert Palace; it said to pray for opening the way. He did so removing the obstacles and in the Palace he found the Pendant of Power. The last one was on Death Mountain, there Link met a strange old man who had got lost while taking a walk. He told Link about his granddaughter who had been taken to the castle and never returned and warned Link that if he was to enter the Dark World, the Moon Pearl kept with the Pendant of Wisdom in the Tower of Hera on top of Death Mountain, would have been essential. Then to thank the lad for escorting him, he offered a strange mirror to Link, recommending to gaze into it if he happened to wander in a "magical transporter" (which would mean a gate to the Dark World). Climbing up the mountain Link found the Spectacle Rock, and a strange, twisted panel on the ground. Once stepping on it the world went white and when the light faded Link found himself in the Dark World. There was a regular storm on the mountains there, and the whole sky, described in legends as glowing gold, was now completely covered by dark clouds. Struck in terror, Link found out he was now a pink bunny, he met strange people and they told him that the world they were in reflected what was in their hearts. Link was, back then, absolutely scared; maybe not only for the Dark World but for the whole of his perilous journey (after all Links quiet life was shattered in just one night). However, proceeding in his quest the youths spirit would grow stronger and win his fear. Link noticed the absence of the Spectacle Rock, he stood in its place and gazed in the Magic Mirror. He didn't know at the time, but being able to use this mirror was further proof that he was in fact the hero (as obtaining the Moon Pearl would be). The world went white again and he found himself on the Spectacle Rock, before the Tower of Hera. The tower was full of strange resilent monsters but in the end Link managed to obtain the Moon Pearl, necessary to remain himself in the Dark World, and the last Pendant, that of Wisdom. His quest for the symbols of virtue complete, Link headed to the Lost Woods. and pulled it out sending the pendants flying through the air and removing the strange mist. The voice of Sahasrahla echoed in Links head, he congratulated Link for his achievement and told him he was sure that with this sword Link would have been able to deflect the wizards magic. Then just as Link was leaving the forest, he heard in his mind Zeldas voice screaming for help: the soldiers had come to the sanctuary. He hurried there but only to find the priest almost gone; in his last breaths he told Link that the soldiers who abducted Zelda took her to the castle and that he had to be quick and save her before Agahnim could complete his magic. 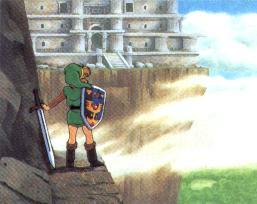 So Link went as fast as he could to the castles tower and with the Master Sword dispelled the barrier on the door. He was a bit slowed down by soldiers but in a flash he was on the top floor. There he found Princess Zelda lying on a monstrous altar and the evil Agahnim behind her. He was waiting for Link so he could witness Zelda's last moment, and as he had planned Zelda floated in the air and vanished when struck by his magic. The Seal of the Seven Sages could now be broken, soon evil power would have covered Hyrule. Agahnim laughed, stating that the tribe of evil living in the Dark World couldnt be beaten even by the legendary hero since they were armed with the Power of Gold, the Triforce, and with that said he left the room. Link followed him and they begun fighting. Links weapons were useless and hitting Agahnim with the Master Sword only resulted in being electrocuted. Then he remembered Sahasrahlas words and using the sword deflected the wizards magic against him. After a few hits Agahnim decided to run away and disappeared drawing Link too in the Dark World. The youth opened his eyes and found himself on the top of an unknown pyramid. 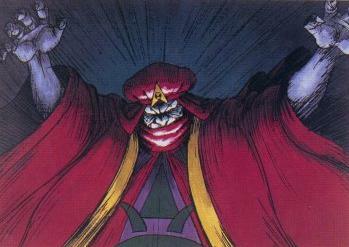 Ganon built it in the middle of the Dark World (upon the remains of the Temple of Light) for... a certain purpose. Once again a voice echoed in Links mind, it was Sahasrahla: he told Link that now, with the wise mens seal about to break, a gate to connect the two worlds was opened at the entrance of Hyrule Castle; soon with his army ready, Ganon would conquer the Light World. Sahasrahla then said the only way to avoid this was to win back the Triforce and, in order to do this, rescue the seven maidens who's spirits Agahnim sent to the Dark World: as descendants of the wise men they had powers that would prove to be necessary in Links quest. Unfortunately the maidens' spirits were encased into crystals and locked in seven dungeons: the first of them, the Dark Palace, was placed in the same place as the East Palace in the Light World and so Link, worried for Zelda, headed for it. About where stood Sahasrahlas hideout Link found a strange building with a bush inside; it once was a man who entered the Dark World to find the Triforce, only to discover that the Triforce obeys no one but the first person who touches it and be changed by the Dark World. So, it would not be sufficient to take back the Triforce, Link had to destroy Ganon to save Hyrule. With this thought in his mind, the youth continued his journey to save the maidens. Each one was guarded by huge monsters and during his quest Link had often to return to the Light World before he could enter the dungeons, as a change in one world was often corresponded in the other. Link had to go through the Dark Palace, the Swamp Palace (where Link used flippers he had bought from the River Zoras), the underground of the Skull Woods, the gargoyle statue in the village of the outcast (probably the first half breed Gerudos that went looking for their king and ended in the Dark World. Here Link fought the old leader of the lost wood thieves Blind), the Ice Palace and the Misery Mire; all full of Ganons minions. During this undertaking Link met a strange boy slowly changing into a tree, he asked for the flute he once used to talk with animals and after hearing it he stopped talking as the morphing process was completed; but before this happened he asked Link to bring the flute (actually a blue ocarina) to his father in Kakariko village. He did so and once informed of his sons fate, the old man asked Link to play the flute in front of the weathercock, and incredibly it broke revealing the boys bird pet which helped Link by carrying him to many places. The youth also saved the village swordsmiths partner and they proved to be two of the greatest swordsmiths ever by tempering the Master Sword making it more powerful! ...and he alone must face the person who began the Great Cataclysm. If the evil one destroys the Hero, nothing can save the world from his wicked reign. The six maidens rescued, only Zelda remained to be saved. Link moved toward the Turtle Rock on the Dark Worlds mountains where she was held captive; on the way to it, he went to the pyramid and found Venus, the queen of faeries, that Ganon had imprisoned for she had the only weapon capable of destroying him the Silver Arrows! The faerie entrusted them to Link and empowered his Legendary Weapon making it the golden glowing Fairy Master Sword, the most powerful blade to ever exist. With such power it was easier for Link to defeated the last guardian, Trinexx. Zelda urged Link to reach Ganons tower where the King of Darkness was waiting to pass in the Light World; once there the Crystals begun to float and in a flash where stood a pillar there was a stairway to the second floor of Ganons Tower. 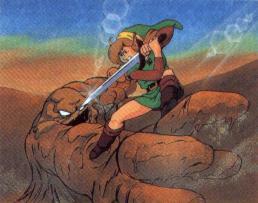 Inside Link fought the guardians of the pendants again and on the top he finally found his old foe Agahnim. The evil Wizard attacked Link with the help of two shadows of himself, but as before he was quickly defeated, and once he had collapsed to the ground, the dark blue shadow of a wild boar emerged from his body: Ganon. Still ethereal the King of Darkness morphed in a bat and fled the tower, but the Legendary Hero was not going to let him escape: he played his ocarina, the bird in the Light World heard the call through the castles gate, went into it and reached the tower. Link grabbed his claws and chased Ganon to the Pyramid of Power. The huge bat broke the ceiling and Link followed him trough the hole he made. Centuries had changed the King of Darkness, he was nowhere as large as when he was imprisoned, but his magic powers were much stronger. The Legendary Hero could not notice the differences since this was the first time he met Ganon but he was not afraid: the long journey had made him more mature, and the three forces in his mind were now perfectly balanced. Ganon was surprised that a youth as Link was capable of defeating his alterego, Agahnim the Dark Wizard, twice; and then in order to realize his wish to conquer both worlds he understood he had to kill Link. Unfortunately for him the Triforce could not be used for this, as the Master Sword blessed by the Gods protected Link from the True Force. So the Legendary Hero and the King of Darkness began their destined battle. Ganon used his trident to throw bats made of fire at Link and the hero avoided them, slashing at the fiend; then the King of Darkness made part of the floor collapse and darkened the room, Link lit up the torches and hit Ganon again. The King of Darkness was paralyzed, his body and clothes had turned light blue; but Link could not hurt him with his sword as long as Ganon was stuck and suddenly as the torches stopped burning, the room was dark again... and Link fell through the floor! The ceiling reformed above Links head, he had to fall from the top of the pyramid again, but just then a message from Sahasrahla reached his mind: the only way to destroy Ganon, was to shoot him with the Silver Arrow while he was paralyzed. With this new information Link fought Ganon again and each time the King of Darkness was stuck Link hit him with the Silver Arrow. At the fourth arrow Ganon let out a long, low and pained moan as his body exploded and was reduced to dust. Link rejoiced and a secret door opened. Inside he found a pit and from it three golden triangles rose; the purpose for the Pyramid revealed... to house the Triforce. The Essence of the Triforce gently spoke in his mind: it told Link about itself, that the Triforce grants the wishes in the heart and mind of the person who touches it and the stronger the wish, the more powerful the Triforces expression of that wish; that the Triforce was now waiting for a new owner and asked Link to touch it with a wish in his heart. Thus the Legendary Hero finally had the Triforce in his hands and his wish was to heal Hyrule from all the events that Ganon caused, restore it to the way it was before his quest. The wish was granted and all the misfortunes that befell Hyrule were erased: the King was revived and so the descendants of the Wise Men, the sanctuary priest, Links uncle, the castle guards. Even the people trapped in the Dark World like the flute boy, the guys on the mountains, Venus and the others were taken back to the Light World, regaining their original shape. Everyone safe, Link returned the Master Sword to its sleep in the forest, and while all this happened the Dark World morphed to reflect what was in Links heart: his beloved land of Hyrule. The dark sky turned gold then blue and the only signs remaining of Ganons evil were the buildings he had created in that world. But before concluding this tale, it is worth mentioning that while Link was exploring the pyramid, he found a dungeon within it, the so called Palace of the Four Swords. 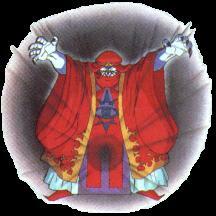 Inside, Ganon had all of his stronger minions and creatures guard an object he never wanted to find on his path again. The palace had four wings and at the end of each Link fought a powerful guardian (among them the revived Blind) winning a sword of a different color from each of them. Once he had all four, he ventured deep into the Palace and found himself into a room where the swords seemed to take life and lo! From each of them appeared a dark being that looked just like him. Link fought and defeated the four shadows and the swords fused into one. He took the sword and left the place, satisfied that evil no longer lurked into it.